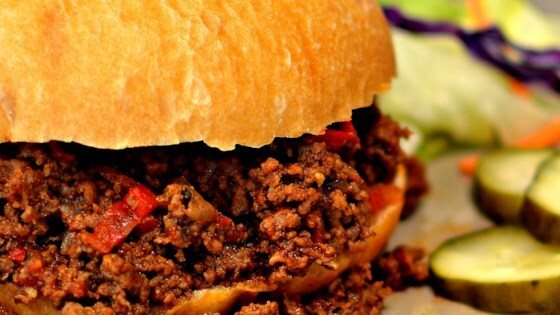 "A combination of lean ground beef and apple cider vinegar makes this sloppy Joe recipe slightly sweet and slightly tart, made right there in your Instant Pot®. Enjoy!" Turn on a multi-functional pressure cooker (such as Instant Pot(R)) and select Saute function. Add oil and tip pot to coat the entire bottom. Add ground beef, onion, and red bell pepper. Season with salt and black pepper. Cook and stir until vegetables are soft and beef is no longer pink, 5 to 7 minutes. Drain and discard grease. Add garlic to the pot and cook another 30 seconds. Add vinegar. Stir in water, brown sugar, mustard, Worcestershire sauce, tomato paste, chili powder, and red pepper flakes. Add crushed tomatoes and stir well. Close and lock the lid and close the vent. Select high pressure according to manufacturer's instructions; set timer for 5 minutes. Allow 10 to 15 minutes for pressure to build. Meanwhile, toast hamburger buns and coat with butter. A great recipe! No tweaking necessary. Thank you Bren. Loved it. I would recommend doubling up if you are going to feed 2-5 people. As this is barely enough sloppy joes sandwiches for two grown men if you think about it haha.